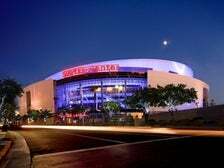 Located at L.A. LIVE in Downtown L.A., STAPLES Center is a versatile venue that is home to four professional sports teams (Los Angeles Lakers, Los Angeles Clippers, Los Angeles Kings, Los Angeles Sparks), has hosted the Grammy Awards 13 times, as well as countless other high-profile concerts and sports events. The AEG-owned arena, which spans 950,000 square feet, opened its doors in October 1999 and has been a favorite of location scouts ever since. The HBO series Entourage shot four episodes at STAPLES Center, including Season 3’s “Less Than 30,” in which Vinnie Chase (Adrian Grenier) is gifted with courtside seats to a Lakers game courtesy of his new agent, Amanda Daniels (Carla Gugino), as a birthday present. The venue was also the site of Michael Jackson’s televised public memorial service on July 7, 2009. 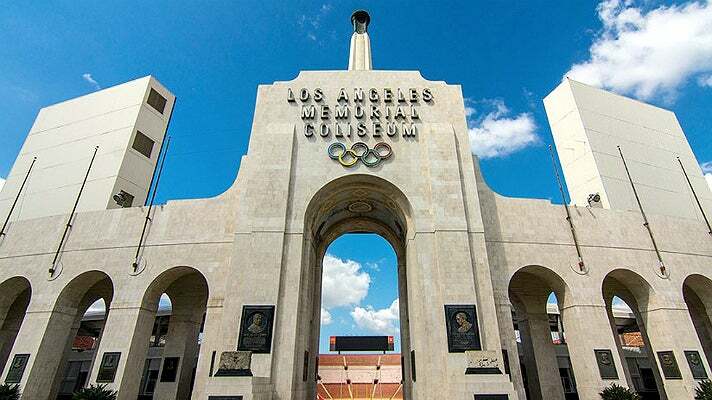 Los Angeles Memorial Coliseum – "Full House"
Named in honor of World War I veterans, Los Angeles Memorial Coliseum was designed by architects John and Donald Parkinson and has the distinction of being the first stadium to host two Summer Olympic Games, in 1932 and 1984. Construction began on Dec. 21, 1921 and concluded on May 1, 1923. 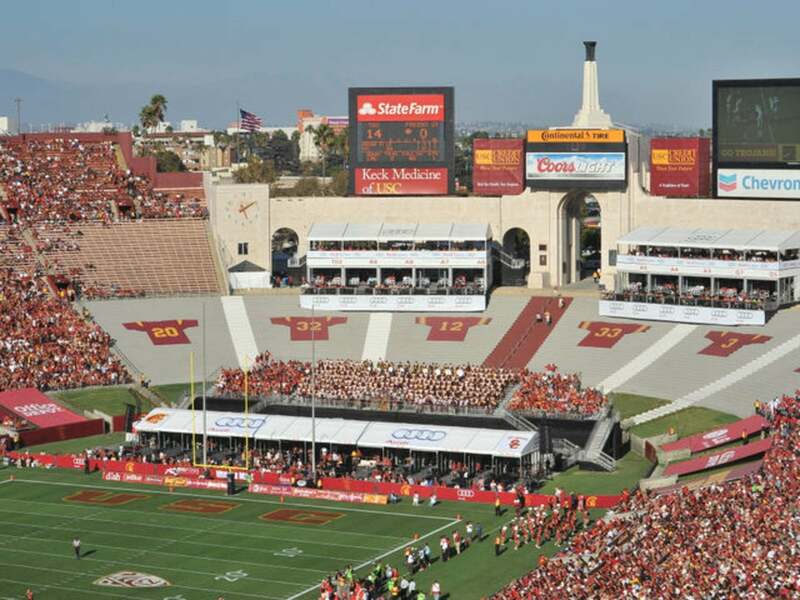 The 93,607-seat stadium has been renovated several times over the years and today serves as the home of the University of Southern California (USC) Trojans football team. 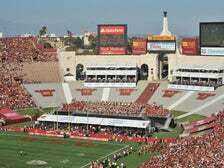 The Coliseum will also be the home of the Los Angeles Rams in the 2016-2018 seasons. Designated a National Historic Landmark and added to the National Register of Historic Places in July 1984, the Coliseum has been immortalized countless times on screen and is easily one of the most recognizable sports stadiums in the world. In the Season 2 episode of Full House titled “Beach Boy Bingo,” the Tanner family memorably attend a Beach Boys concert at the Coliseum – and get to sing “Barbara Ann” with the group onstage. The Coliseum was also where Dean Pritchard (Jeremy Piven) bribes Student Council President Megan Huang (Sara Tanaka) in order to get her to revoke the temporary status of the Alpha Epsilon Omega fraternity in the 2003 comedy Old School. The stadium has also appeared in The Last Boy Scout, Money Talks and a Season 1 episode of Alias. Dodger Stadium – "Modern Family"
The home of L.A.’s beloved Major League Baseball team, Dodger Stadium is no stranger to the big or small screen. 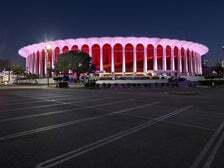 The 56,000-seat venue, which opened to the public on April 10, 1962, has appeared in everything from Elvis Presley's Spinout (1966) to the 2007 action hit Transformers and the 2011 sports drama Moneyball. 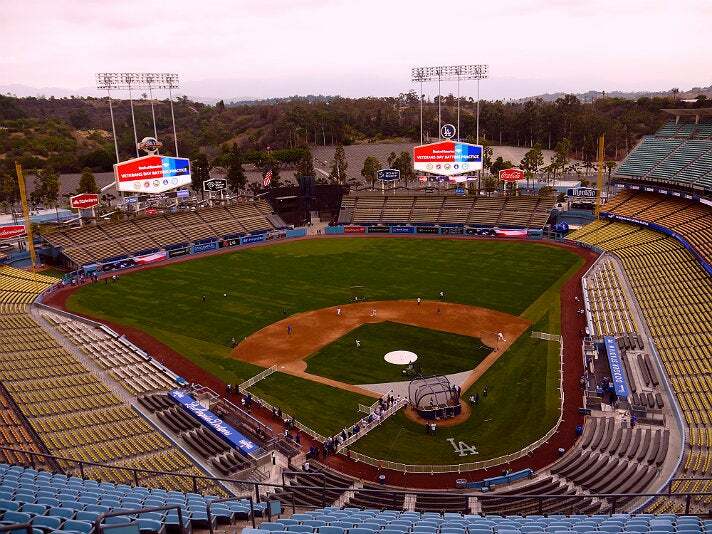 In the Season 1 episode of Modern Family titled “Up All Night,” Javier (Benjamin Bratt) memorably takes Manny (Rico Rodriguez) and Jay (Ed O’Neill) to an empty Dodger Stadium to hit some balls in the middle of the night. The venue’s expansive parking lot, which boasts space for a whopping 16,000 cars, was featured in both The Fast and the Furious and Furious 7, as well as countless other movies. One filming that took place at Dodger Stadium is particularly notable as it ended up exonerating a murder suspect. Juan Catalan was arrested for a killing that took place on May 12, 2003, despite his claims of an airtight alibi – he was at a Dodger game that day. Catalan sat in jail for more than five months, until his lawyer got hold of some raw footage of the Season 4 episode of Curb Your Enthusiasm titled “The Car Pool Lane,” which was filmed at the stadium on the same day as the murder. Sure enough, Catalan was visible in the footage and he was freed from jail. Grand Olympic Auditorium – "Rocky"
Grand Olympic Auditorium was originally built in 1924 for the 1932 Summer Olympics, during which it hosted boxing, weightlifting and wrestling events. 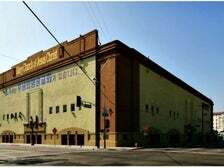 Though the historic venue has been the site of everything from rock concerts to roller derby scrimmages in the years since, it is most famous for being a boxing arena. 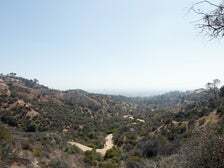 As such, it was utilized in the 1976 boxing drama Rocky as the spot where the climactic fight between Rocky Balboa (Sylvester Stallone) and Apollo Creed (Carl Weathers) takes place. 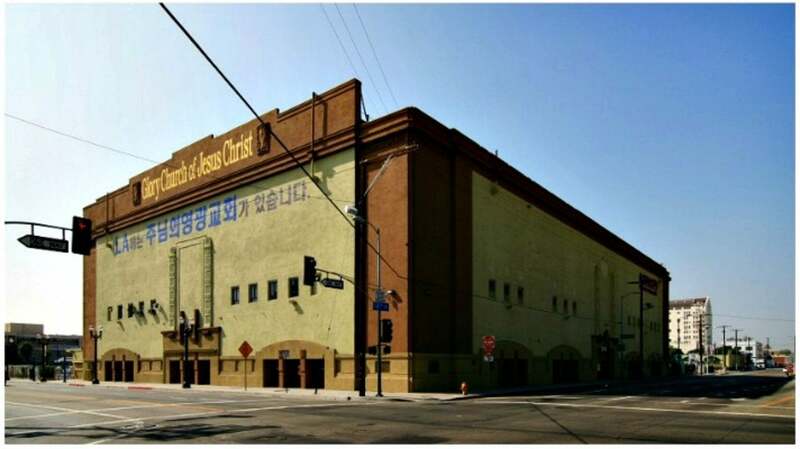 Scenes from the movie’s 1982 sequel, Rocky III, were also lensed at Grand Olympic Auditorium. The property was shuttered from 1987 through 1994 and was subsequently reopened as a special events/sporting venue until it was purchased by the Glory Church of Jesus Christ in 2005. Today, it operates as a religious facility and occasional filming location. Besides the Rocky franchise, the arena has also appeared in The Champ, Raging Bull, Million Dollar Baby and Ed Wood. 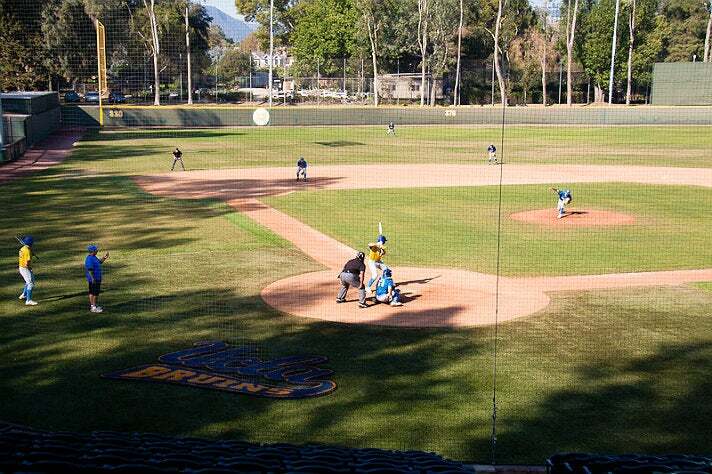 Jackie Robinson Stadium – "Never Been Kissed"
The home stadium of the UCLA Bruins baseball team is named in honor of one of the school’s most famous alumni, Jackie Robinson. The baseball great attended the university from 1939 to 1941 and became the first student to letter in four sports in a single year. Robinson left UCLA during the spring semester of his senior year in order to take an assistant athletic director job with the National Youth Administration and subsequently went on to become one of the greatest baseball players of all time. He was also the first African American to play for the major leagues since the 1800s. The 1,820-seat stadium that bears his name was constructed in 1981, thanks to a large donation from one of Robinson’s classmates, philanthropist Hoyt Pardee. In the 1999 romcom Never Been Kissed, Josie Geller (Drew Barrymore) famously waits on the pitcher's mound for her first real kiss from the man of her dreams, Sam Coulson (Michael Vartan). Though the wait turns out to be a bit longer than expected (as Sam explains, “It took me forever to get here!”), Josie finally gets her smooch – and lives happily ever after. 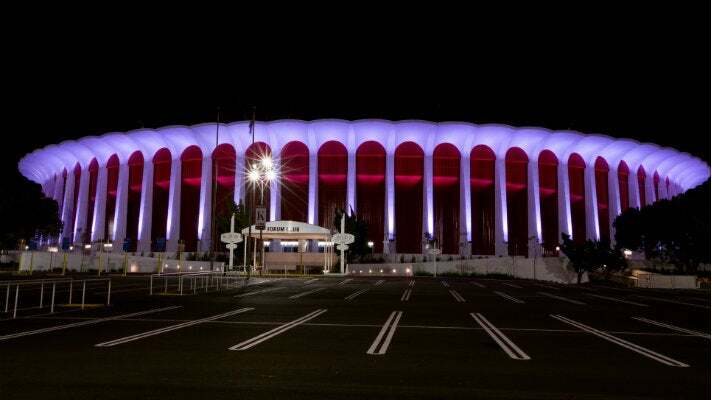 The Forum – "Beverly Hills, 90210"
The circular indoor arena known as The Forum is most famous for serving as the home of the Los Angeles Lakers and the Los Angeles Kings from 1967 to 1999. The 17,500-seat venue, which was originally constructed in 1967, also hosted the 1984 Olympic basketball games and the Big West Conference men’s basketball tournament from 1983 to 1988. After STAPLES Center was built in 1999 and became L.A.’s main major sports arena, The Forum was utilized as a church and special events venue. It was then purchased by The Madison Square Garden Company in 2012 and a massive multi-million-dollar renovation was begun. The revamped arena opened to the public in January 2014. During its tenure as the Lakers’ home court, The Forum made a memorable appearance in the Season 3 episode of Beverly Hills, 90210 titled “Senior Poll” as the spot where Steve Sanders (Ian Ziering) famously makes a halftime half-court basketball shot, winning $10,000 in the process. One of The Forum’s bathrooms also appeared in the episode, masquerading as the West Beverly High School restroom where Donna Martin (Tori Spelling) and the girls get ready for their Senior Poll yearbook photos. The Forum has also been featured in Hannah Montana: The Movie, Space Jam, Bedazzled and Lethal Weapon 3. 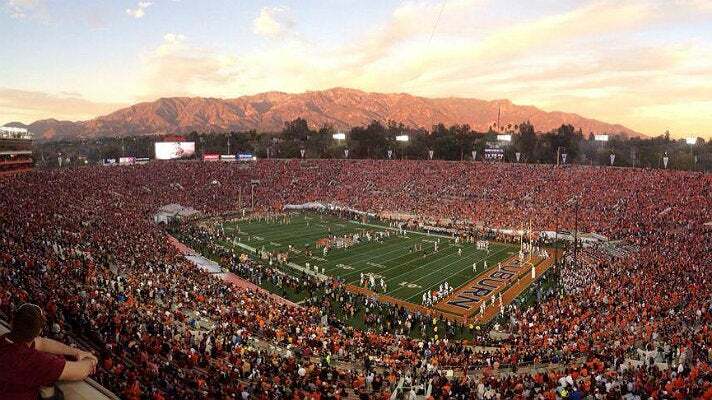 Rose Bowl Stadium – "Cheaper by the Dozen"
Originally built in 1922, Rose Bowl Stadium is listed on the National Register of Historic Places, designated a National Historic Landmark, and is the home field of the UCLA Bruins football team. 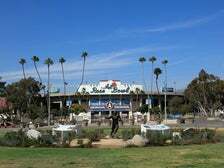 Best known as the home of the namesake football game that climaxes the annual Tournament of Roses in January, the Myron Hunt-designed stadium has also played host to five NFL Super Bowls, the 1984 Olympic Gold Medal soccer match, and the FIFA World Cup and FIFA Women's World Cup Finals. For non-sports fans, the stadium hosts a popular flea market the second Sunday of every month. Pote Field – "Jerry Maguire"
In the closing scene of the 1996 romcom Jerry Maguire, the film’s titular character, played by Tom Cruise, walks hand-in-hand with his new wife, Dorothy Boyd (Renee Zellweger), and her son, Ray (Jonathan Lipnicki), next to a baseball field where a little league game is taking place. When an errant ball makes its way over the fence and lands in front of the trio, Ray picks it up and tosses it back to the waiting players, greatly impressing sports agent Jerry in the process. 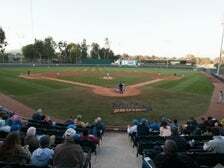 The charming sequence took place at Griffith Park’s Pote Field, a baseball diamond that was named in honor of Major League Baseball scout Phil Pote. 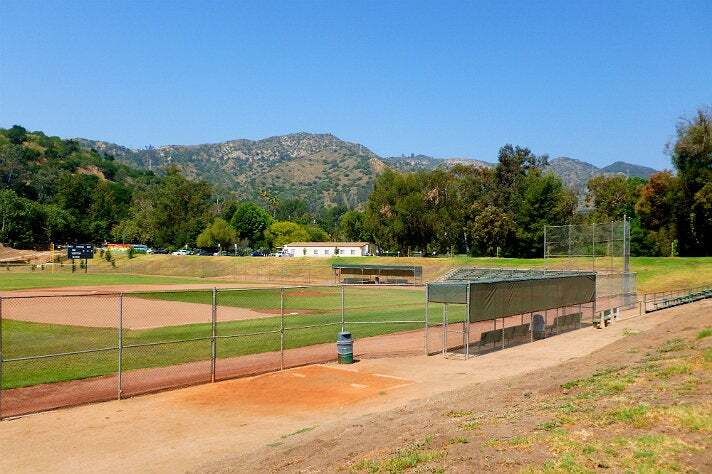 The same spot was also where Jackie Banning (Charlie Korsmo) plays his final little league game of the season in the 1991 adventure film Hook. 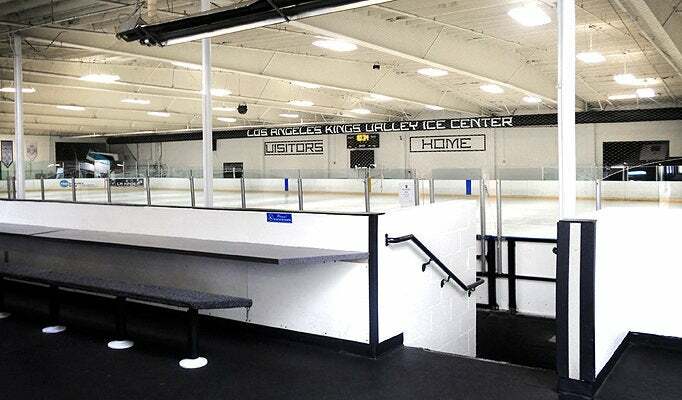 L.A. Kings Valley Ice Center – "The Wedding Ringer"
Originally known as the Valley Ice Center, this Panorama City rink was taken over in 2010 by new owners Scott Floman and David Serianne and given a facelift. The following year, Floman and Serianne entered into a partnership with the L.A. Kings and the rink was re-dubbed the Los Angeles Kings Valley Ice Center. 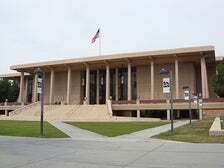 The site currently serves as the home of Cal State Northridge’s Men’s Hockey team, as well as several youth hockey clubs. 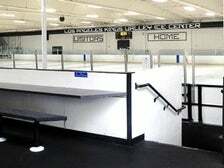 The rink is also used as a filming location. In the 2015 comedy The Wedding Ringer, Doug Harris (Josh Gad) pretends to ice climb by posing for photos at the center with Jimmy Callahan (Kevin Hart) and his fellow hired groomsmen. Matadome – "The Karate Kid"
“Sweep the leg!” That is the advice that Cobra Kai sensei Kreese (Martin Kove) gives to Johnny (William Zabka) during the All-Valley Karate Tournament at the end of The Karate Kid. However it's Daniel LaRusso (Ralph Macchio) who prevails, overcoming Johnny with a crane kick to the face, thereby winning the tournament. That memorable scene was shot at the Matadome, located on the campus of California State University, Northridge in the San Fernando Valley. 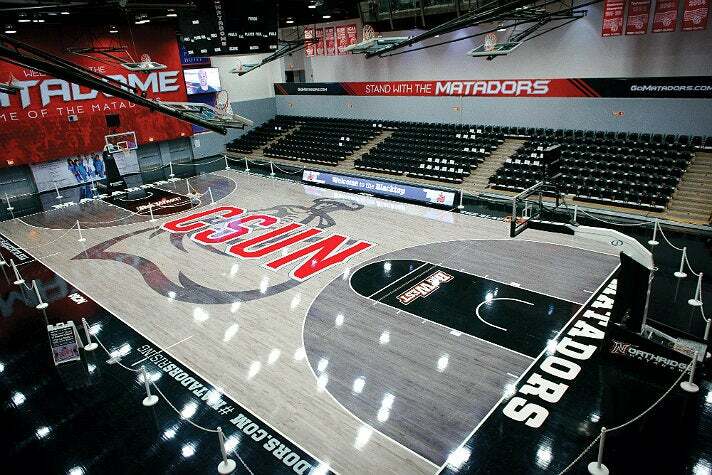 Also known as Matador Gymnasium, the multi-purpose venue is the home of CSUN's men's and women's basketball and volleyball teams. The Matadome, which was originally built in 1962 and can seat more than 1,600 fans, has been remodeled several times since The Karate Kid filming took place. Though it's still recognizable, the arena looks quite different today than it did onscreen in the 1984 classic. The Matadome also portrayed the basketball arena where the Coolidge College Chickadees play in the 2002 comedy National Lampoon’s Van Wilder.